The researchers found that compared with a saline solution, the amino acid rehydration formulation prompted a “significant” twofold increase in the number of precursor cells that ultimately become functional intestinal cells. It also resulted in longer intestinal villi and increased the number of transporters that are essential for electrolyte and nutrient absorption within the small intestine. All of that shows that the rehydrating drink is capable of boosting villus growth and improving gastrointestinal function during radiation treatment, Vidyasagar said. That holds some promise for cancer patients, who typically can’t tolerate a full therapeutic dose of radiation. By increasing their tolerance, more patients might be able to receive the full tumor-killing dose of radiation therapy, Vidyasagar said. Beyond helping with the management of gastrointestinal side effects due to cancer therapy, Vidyasagar said amino-acid based solutions could also have important implications for conditions such as Crohn’s disease, an inflammatory bowel disorder that causes abdominal pain, weight loss and fatigue. The condition affects as many as 780,000 people in the United States, according to the Crohn’s & Colitis Foundation of America. Likewise, the rehydrating drink might prove useful in addressing the effects of celiac disease, which causes an immune response that attacks the small intestine when people with the disorder eat gluten. 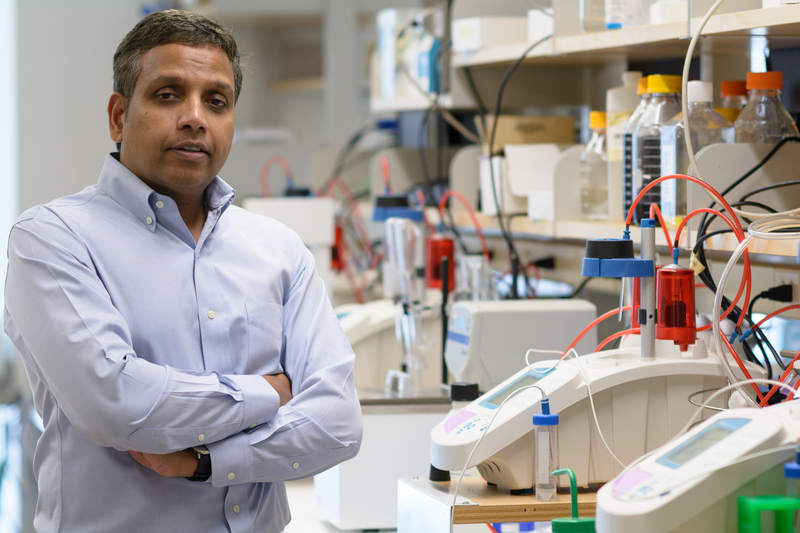 While UF researchers have yet to study the rehydrating drink’s effect on those conditions, Vidyasagar said the current findings show how systematically selecting certain amino acid formulations can produce beneficial effects on the gastrointestinal tract. The research was partially funded through grants from the National Space Biomedical Research Institute and a research agreement with Entrinsic Health Solutions Inc., which makes the amino acid formulation. UF licenses the formulation to Entrinsic. “We are thrilled with the demonstrated efficacy of the amino acid formulation in this radiation model because this simple and safe solution could potentially protect astronauts from the harmful effects of radiation during space exploration,” said Dorit Donoviel, Ph.D., deputy chief scientist of the NSBRI. Both Vidyasagar and Paul Okunieff, M.D., chair of the UF College of Medicine’s department of radiation oncology and a co-author of the journal article, have shares in Entrinsic Health Solutions, where Vidyasagar is the chief scientific officer.